Those who are on the way of attachment to Krishna, should avoid the first obstacle, surrender gurus, discussing the emergence of Putana in Vraja, took the form of a wet nurse. There are two kinds of gurus - antaranga, internal and bahiranga, outdoor. The living entity, which is immersed in samadhi - is its own antaranga guru. Anyone who accepts the arguments and disputes as a guru and who is studying the process of worship in such a guru, he took refuge in gurus. When the arguments and debates are issued for what nourishes the eternal duty of living beings, it is compared with the false position of confused as being a nurse. Walking along the path of attachment must convert all the arguments and controversies in spiritual matters and enter into a state of samadhi. The outer guru - is the one who teaches the science of worship. Anyone who knows the right way of affection and who instructs his students in accordance with their qualifications, a sad-guru, or the eternal guru. Anyone who does not know the way of affection for Krishna, but still tries to teach others to follow this path, or who knows this way and instructs his disciples, not because of their qualifications, are gurus and should be rejected. The second obstacle - is false arguments and arguments. Until Trinavarta in the form of a tornado was killed in Vraja, it was difficult to awaken ecstatic emotions. In Trinavarty shape, speculation of philosophers, Buddhists and logicians, presented obstacles to the development of ecstatic Vraja emotions. This game refers to false pride, appearing due to useless, in fact, a scientist who is the cause of all sorts of debates with bickering, dry reasoning and dry logic disputes in the company of those who all love it too. This is fertile ground for the emergence of sinful, devilish philosophies. Krishna the child becomes kindly disposed, when he sees the humility of His devotees (who do not show this kind of vanity scientists), and choking this demon in the form of a tornado on behalf Trinavarta. In doing this, he removes this thorn, pricking execution devotees devotional service. Lila with Shakatoy (broken wagon) indicates the state of mind that is like carrying heavy loads, and the associated problems that arise as a result of bad karma, which appeared in past lives, and in the present. The result of all this - the stupidity and false pride. The child Krishna breaks the cart-demon, hitting her, and so he throws it away desecration. Those who do not understand the purpose of governing principles, but just bear this burden, following them from the formalities are not able to develop an attachment to Krishna. When a person breaks into pieces Shakatu personifying bearing the burden of governing principles, it overcomes the third obstacle. Gurus who did not take into account the skills of their students in the way of the development of attachment and thus instructed Shakate many such people, how to serve in the mood and sakhi manjari, commits an offense in the form of disrespect for intimate topics and therefore fell. Those who follow this instruction, is also gradually go out of the way of the spiritual life, because they did not develop signs of deep attachment to these intimate topics. However, they can still reach the correct targets if they communicate with the true devotees and follow their instructions. This is called the destruction Shakaty. Living beings by nature are prudent, but when they fall under the stimulating effect of the body, consisting of flesh and blood, it is called the Ball-dosha, or youth offending. This is the fourth obstacle, in the form of Vatsasury. Children mentality generates this kind of greed that leads to playful, in the bad sense, actions. This undesirable defect called "Vatsasura", or demon-calf. Krishna very kindly put an end to this problem. Tricky Bakasura, the personification of false religion, is the fifth obstacle to Vaishnava. This is called nama-aparadha, insult the holy name of the Lord. Those who, lacking qualifications and take instruction gurus are engaged in worship, intended for advanced devotees, - deluded, narrow-minded people. And those who understand that are not qualified, but, nevertheless, for the purpose of getting rich and gain a reputation for cheap follow the process of worship, intended for advanced devotees are deceivers. As long as people will be deceived by this false religion, it will not be able to awaken their affection for Krishna. Such people are deceiving the whole world, showing sectarian sentiments and their false renunciation. Aghasura (demon-serpent), personification of intolerance and cruelty, is six obstacles. Due to a lack of compassion for living beings there is the likelihood that human affection is gradually reduced as compassion can not exist separately from attachment. The basis of compassion for living beings and devotion to Krishna - are equal. The game, which Lord Brahma manifests his confusion clears process fruitive activities and speculative knowledge development, which will ultimately lead to a skeptical frame of mind. This pastime also eliminates the insult, related to the fact when you do not give proper respect highest quality transcendent Lord of sweetness (madhurya) for the sake of its children magnificent riches (aishvarya). If a person is excessively involved in various disputes, arguments, arguments and read the literature that accompanies this reasons and arguments, all awareness, achieved by means of samadhi loss. This is called illusion, based on the flowery words of the Vedas. Immersed in the illusion of Brahma doubted Krishna dominant position. Vaisnavas should consider this illusion as the seventh hurdle. The ability to thin distinction is very important for Vaishnavas. Those who invent ways of worldly distinctions and preach the indestructible principles of Vaishnavism, while distorting and adapting them to fit their needs, have the ability to distinguish the rough. This ability takes the form of a donkey Dhenuka. Donkey can not eat sweet fruits growing on a palm tree, and does not allow others to enjoy their taste. The meaning of this is that the previous acharyas authoritative sampradayas wrote a lot of spiritual literature, which people are deprived of their ability to distinguish themselves do not understand and do not allow others to study it. Short-sighted devotees who just formally follow the regulative principles and are influenced by the rough distinctions, not able to rise to a higher level of development. The principles of Vaishnava is so infinitely exalted, that those who are just interested in mindless mechanical follow regulative principles without trying to understand the science of attachment, compared with ordinary people, attached to the fruits of their activities. Therefore, as long as the donkey Dhenukasura will not be killed, a person can not understand the science of Vaishnavism. Some people are inflated by false pride on what are the followers of religions, fraudulent, invented by fraudsters. This situation is the reason that they do not express reverence pure devotional service. 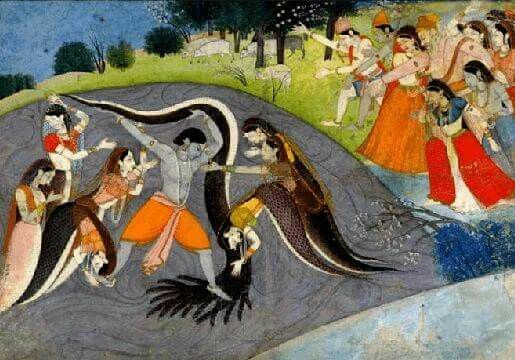 Krishna destroys this trend, bull-killing demon Arishtasuru. Many weak-willed people leave the path of regulative principles and take the path of attachment. Not able to understand the spiritual affection of the soul, they behave like Vrishabhasura (Arishtasura), developing a perverse material attachments. They will be killed by the brave Krishna. An example of such obstacles commonly found among the self-righteous Dharma dhvadzhey, pretenders, posing as devotees. 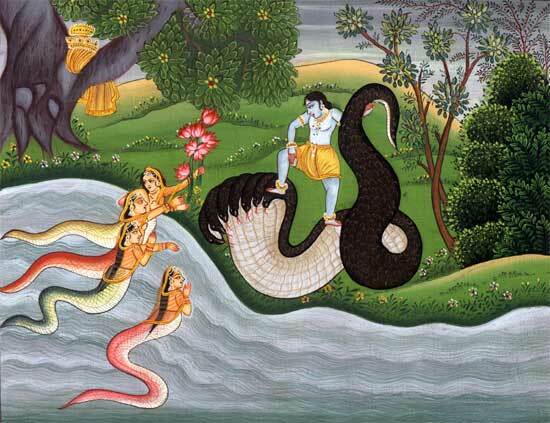 Wickedness Kaliya serpent always defile the water of the Yamuna, which are similar to the spiritual life-giving moisture Vaishnava. The duty of each - is the tenth hurdle to overcome. Punishment Krishna Kaliya eliminates false pride, envy, crime against others, snake-like cunning and ruthlessness. Eleventh obstacle to the Vaishnava is sectarianism, which takes the form of a forest fire. Because of the sectarian views of a person does not consider other Vaishnava devotees, and as a result - on his way he meets many obstacles in finding a guru and the association of devotees. It is therefore important to put out the wildfire. Wildfire represents the disputes and hatred between different groups, organizations and religions, hostility to the image of God, who is worshiped by others, and in general any war conflict, and so on. The impersonalists wish to merge with the impersonal Brahman. In other words, the desire for liberation in the impersonal Brahman, like the destruction of their individual "I", because it is impossible to experience happiness in a position to hook. No living being, nor the Lord did not get out of this state, nothing of value. If a person believes in the philosophy of the impersonalists, he should be taken that the material world is false. Then the man condemned Brahman as the indifferent, impersonal substance, and gradually he develops doubts about Brahman. If a person is deeply consider and analyze this subject will come to the conclusion that ignorance and oblivion of a living being meaningless. Thus, all human efforts and thoughts are meaningless. Sometimes this philosophy penetrates the Vaishnava society in the guise of Pralambasura to distribute anarthas in the form of the destruction of his "I". This twelfth obstacle placed in the way of science in understanding Vaishnava spiritual love. Thirteenth obstacle to the Vaishnava - the worship of demigods, such as Indra, with the desire to enjoy the fruits of their activities, even after the adoption of the process of devotional service. Krishna forbids worshiping the demigod Indra, the rain to drop people's ideas about the welfare of the worship of many demigods for material benefit. Also, he did it in order to eliminate the confusion lifted up the soul, began to think: "I - the Most High, I am worthy of worship by others." Fourteenth obstacle in the development of love of Krsna are stealing other people's property and fraud which create anxiety in Vraja in the image Vomasury . 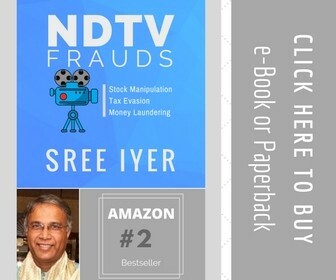 Krishna killed the demon, flying in the sky, thus giving instruction to His devotees to leave the company of thieves and other wicked, as well as any pretenders and cheaters as "devotees of Lord Krishna," people just ryadya in clothes devotees. The transcendental happiness of living creatures in Vraja is known Nanda. In order to enhance this happiness, some people, misled, drink wine, and as a result create anartha forgetting yourself (anartha means something "unwanted"). 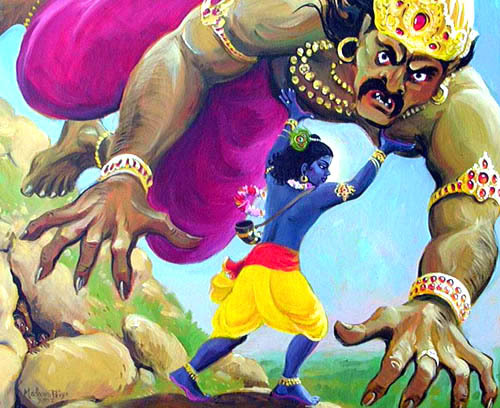 Abduction of Nanda in the abode of Varuna is the fifteenth obstacle to Vaishnava. Those who are in the mood of Vraja, never drink alcohol. Through this game Krishna destroys the delusion that bhajan bliss enhanced adoption of wine and other intoxicants. The desire to win fame and material delight the senses through the bhakti is the sixteenth obstacle called Shankhachuda. Those whose actions are motivated by the desire for fame, acting out of a sense of pride and arrogance, so the Vaishnava should always treat them with caution. By killing the demon-shell diamond and returning abducted them, Krishna kills desire for name and fame, as well as the desire to have indecent contact with women. When Vaishnava happiness gradually intensified in the course of worship, they (devotees above) sometimes lose consciousness. At this point the feeling of merging with God absorbs them. This feeling is like a snake that swallowed Nanda Maharaja. A devotee who carefully avoids this snake will be a genuine Vaishnava. Pulling Nanda Maharaja from the jaws of the serpent is the personification of Krishna rescues the eternal truth of devotional service, which was swallowed by impersonalist Mayavadi and others like them. She also serves as the instruction to leave the company of such serpentine impersonalists. Kesi demon in the shape of a horse, it embodies an idea practitioner, who believes that he is more experienced than others in devotional service. When such a person comes to Vraja, it creates a lot of anxiety to others. When one gradually begins to assert its seniority, it gradually a feeling of contempt for the Lord, and he falls from his position. Therefore it is very important to prevent this disastrous state of mind from the very beginning, when it occurs in the heart. Even very experienced Vaishnava devotional service, he should always remain humble. If he does so, he can defeat the demon Keshi, who is the eighteenth obstacle. This game represents haughtiness and vanity murder manifested in the mood of "I - and a great devotee of a guru." In addition, in this game, Krishna also banishes the false ego attachment to wealth and luxury, which are always accompanied by worldly material achievements. Those who want to happily serve Krsna in the mood of Vraja pure, must with great care to eliminate from its path above eighteen obstacles. Some of them can be addressed by their own efforts and clean, and some - by the grace of Krsna. The living being is capable by itself to eliminate the obstacles that arise in the performance of religious duties, through samadhi, known as savikalpa. "Srimad Bhagavatam" explains that these obstacles are actually destroyed by the Lord Balarama. But also "Bhagavatam" explains that the obstacles that disrupted taking refuge in Krishna, in fact eliminated by Him. People like swans, possessing insight and know how to make fine distinctions between certain things, should carefully discuss these topics. Srila Bhaktivinoda Thakur, "Sri Krishna Samhita ',' Sri Chaitanya Shikshamrita"